Jamaica Sunshine Tours is an authentic Jamaican Tour Company that offers history on Jamaica, tours around the beautiful Island, transfer services and specialized trips. We pride ourselves in providing quality hospitable services that goes beyond our customers expectations. Come experience Jamaica in its true form, the beautiful scenery, delicious Jamaican cuisine and the warmth of the people. Let us take you on a tour, to one of the many exciting locations with trusted Drivers and knowledgeable staff. Set your mind free, relax and enjoy our beautiful Island in the sun. Jamaica is an island country situated in the Caribbean Sea. The Island is 10,990 square kilometers (4,240 sq mi) in area, about 145 kilometers (90 mi) south of Cuba and 191 kilometres (119 mi) west of Hispaniola (the island containing the nation-states of Haiti and Dominican Republic). Jamaica is the fourth largest island country in the Caribbean by area. Jamaica is home to the fastest man and woman on track, Usain Bolt and Shelly-Ann Fraser-Pryce. Jamaica is also home to one of the most popular music forms in the world boasting artistes like Bob Marley, Dennis Brown, Beenie Man, Shaggy, Shawn Paul and Buju Banton. Our heritage has a mixture of different cultures which have influence to the nation over the early years. There are numerous tours and landmark sites that are preserved for locals and visitors alike. Jamaica Sunshine Tours will take you there in comfort, style and with knowledgeable staff. As they often say "Wi likkle but wi tallawah". You will also find more information on our pages and on our tours about Jamaica. - Milk River Bath: (Clarendon) One of Jamaica's great spas which is also counted among the best spas in the world. - Rose Hall Great House: (St. James) Hear stories of its history, former owner Annie Palmer and how she treated her slaves with cruelty. - Morant Bay Fort: (St, Thomas) Overlooking the harbour in Morant Bay behind the Court House, was built in 1758. The fort was also the scene of riots in 1865. 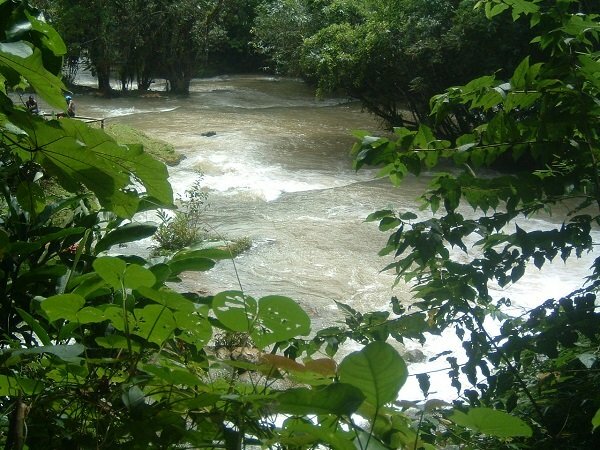 - Dunn's River: (St. Ann) Dunn's River Falls and Park is an astounding flowing falls. Come climb it with us and enjoy the cool waters, lush greenery and the fresh breeze. © Copyright 2018 Jamaicansunshinetours.com All rights reserved. Solo Build It!